Incredible rock formations, abundant wildlife including seabirds and seals (and even the occasional Orca/Minke whale is spotted). This shorter but adventurous hike takes you away from other tourists and does require a bit of scrambling so have your sturdy footwear and of course your cameras ready! Leaving from the village of Arnarstapi, we take a circular route starting at Bird colonies and Basalt. We hike along the ancient cliff-side horse road leading to Reykjavík City that was once used for transporting dried fish. 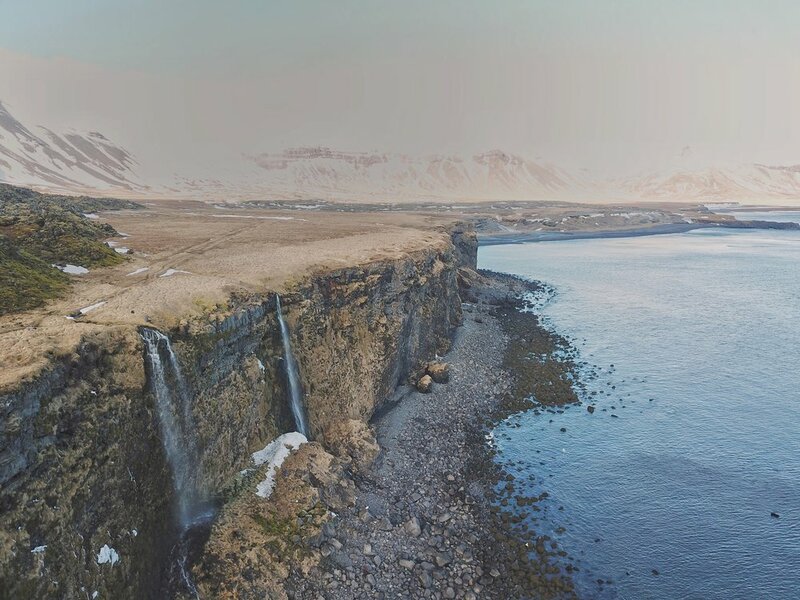 After passing a couple of old settlements hidden next to the mossy lava field, we follow the track down to a little-known black sand beach and visit two beautiful waterfalls (one of which you can actually walk behind). From there, we begin our hike under a set of highly impressive cliffs and their seabird colonies, admiring the incredible geological history on our way. We look up at waterfalls falling down from above, get to drink water that flows out from the bottom of the cliff-face and you will even be treated to a chocolatey lava surprise. We will ascend back to Arnarstapi via a short roped route. A medium level hike that encompasses geology, wildlife, amazing photo opportunities, folklore and most of all ADVENTURE. Guided hike in English and Scandinavian. This Hike covers some harder, slippy terrain and so guests need to have good footwear, balance and a medium level of fitness. The price stated is per person for a minimum of 3 people joining the tour. If less than the minimum 3 bookings are received, it will be priced as a private guided tour (equal to 3 paying guests). - You can book and we will pay you back if we do not get the minimum paying persons. Icelandic weather constantly changes and therefore we reserve the right to postpone/cancel trips due to weather or other factors outside of our control. If we cancel tours, full refunds will be issued.